I’m in the process of watching the finale right now and writing this right after the tribal council where Holly got voted off. I really have to hand it to Fabio, he really poured it on in the last three challenges. That really surprised the alliance of Sash, Holly and Chase. I’m a little surprised that they didn’t get rid of Sash instead of Holly. One thing is sure, though… Fabio really saw through everything Sash was saying. Sash certainly played the hardest during the whole game. Chase flipped flopped like crazy the whole game. I’m sure he won’t have Jane’s vote. She’s as mad (or madder) that anyone that’s ever been voted off. There were a lot of smile when people saw that necklace around Fabio’s neck. He has Dan’s vote. Probably Jane’s too. Not sure about everyone else. Now watching the final tribal council. Fabio showed his easy going side. Sash probably stated his case the best, saying that friendships were made, alliances were made to be broken. What a crazy bunch of questions. Brenda didn’t ask Fabio any question;, Marty had it in for Chase; Holly asked some good questions (and I think there were some honest answers); Jane had nothing to spew but bile at Sash and really didn’t have a question to Fabio; Benry had a good question to Sash and Sash answered as honestly as he could; Dan had it in for Sash too – “spineless”, he had it in for Chase too – he was very animated, no question for Fabio either; Purple Kelly gave 60 seconds to Sash how he outwitted and outplayed – sure sounded like she was going to vote for Sash; Nayanka asked Fabio a GREAT question about his mom… very surprised to her such a great question from her… I really give her a lot of credit for that one; Alina just straight out insulted Fabio by calling him a boy, and gave Sash an opportunity to slam the other two…. Chase basically said that he had to survive, and slammed Fabio too. I’d say odds were pretty good that Sash will take it, but I think Fabio will be close in votes. I hope Fabio wins. I don’t think Chase will get it at all. Commercial – Stunning announcement…. What is it? Is Jeff quitting? Hey, and they’re going to have a “reunion race” on Amazing Race. That should be good. Update: Ok all caught up to the DVR. Fabio probably has Nayanka, Benry, Jane and Dan. Whoa! Marty voted for Fabio! Update: Brenda voted for Chase! Kinda surprised about that. Update: Jeff walks out with the votes into the jungle ….and we get cleaned up versions of Chase, Sash and Fabio. Jeff walks out of the fake jungle on the CBS set. Update: FABIO WINS! YEAH!!!!!!!!!! I’m really happy about this. That’s completely awesome. I’d love to see how the final tally went. Kinda surprised that Sash didn’t even get one vote. Youngest winner ever. 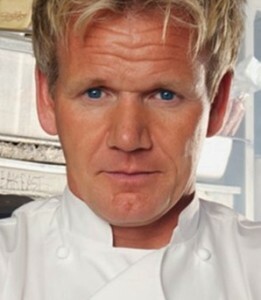 Earlier I posted that a chef that appeared on Kitchen Nightmares has committed suicide. This is the second time this has happened that a contestant that appeared on a Gordon Ramsay show has committed suicide. 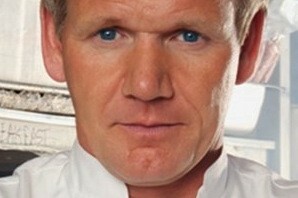 The first was Rachel Brown, who appeared on Hell’s Kitchen. A lot of people are going to jump to the conclusion that this has something to do with Gordon Ramsay’s tactics on these shows. I think that’s completely false. The people who have been shown on Kitchen Nightmares have run restaurants that are failing. The emotional upheaval this must cause for people has to be tremendous. They’re at their wits end, and have asked for frank advice about how to turn things around. And frank advice is what Ramsay gives…both barrels, holding nothing back. Some of these restaurants have gone on to close, some of them remain open. Ramsay tries to help these people turn things around in a short time by trying to be brutally honest with them. It’s very sad that some people think the only way out of situations like this is to commit suicide. Hell’s Kitchen…. Humpf. I do continue to watch this show, but I have to say, they take a very “American Idol First Few Weeks” approach to picking contestants. Some of the contestants are genuinely good. Some of them are NOT good AT ALL. The last few seasons it seems as though they’ve been picking people that have not been prepared to deal with the sort of stress and anxiety that show causes. Some of these people are completely delusional about their abilities, and I find it extremely difficult to believe that Ramsay considers them to be in the running for the restaurant prize, at all. There are many, many cooking competitions on TV: “The Next Iron Chef”, “Top Chef”, Ramsay even just finished a third: “Master Chef”. If they’re truly looking for a person to run a restaurant, why not get chefs of the quality they get on Top Chef? It’s all about the train wreck, that’s why. This must leave some of the contestants, who never, ever had a chance, despite getting on the show, emotionally devastated. I will say that I have no idea what the circumstances were around Rachel Brown’s death, and I’m not blaming the show. She made it through five shows, which is a lot better than most. The problem that got her voted off was that she just had a bad dinner service. I really do think though, that particularly for shows like “Hell’s Kitchen”, it would be a lot better for everyone, all the way around, if they had contestants that did stand a chance to win everything from the get go. 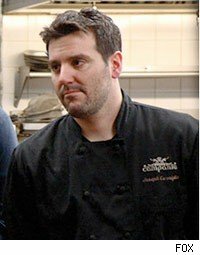 The owner of Campania, Joe Cerniglia, has committed suicide. He appeared on the show in 2007. 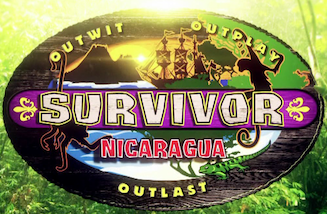 Just a reminder – Survivor: Nicaragua starts Wednesday, Sept. 15th. This time it’s “old” vs. “young”. 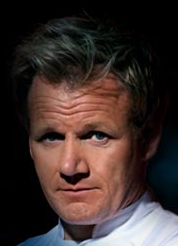 The recession has hit everyone, including Gordon Ramsay who is living his own Kitchen Nightmare. Simon talks about Britain’s Got Talent, and Susan Boyle.